Louis Pagano, executive vice president of Forest Park based Ferrara Pan Candy Company represents the second of three gen­erations of Pagano family members who have helped make Ferrara Pan a worldwide presence and a household name locally. Pagano’s father, Anello, was one of three founders of the company back in 1908. Along with the Ferrara and Buffardi families, the Pagano’s are an integral part of the company that has brought the world favorite candies like Lemonheads, Atomic Hot Fire Balls. Gummi Bears and Fruit Snacks. Pagano attended St. Mel high School in Chicago from which he graduated in 1947. 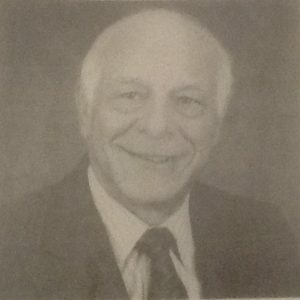 He then attended Loyola University and received his bachelors of science degree in 1951. Pagano had then planned to obtain a law degree from Kent Law School which he attended in 1951. But the call of the family business proved stronger than his chosen profession. Pagano’s first job at Ferrara Pan was as a bookkeeper. He soon went on to become a national sales manager, then traffic manager, and eventually rose to the position as senior vice president. As such, he oversees the company’s worldwide confection sales. Pagano has done fund-raising work for the Villa Scalabrini, and his honors include being named Man of the Year of the candy industry back in 1985 and Dean of the Candy Industry in 1986 In 1993, Pagano was inducted into the Candy Hall of Fame Pagano is also proud of his stint as president of the Butterfield Country Club, a title he had from 1986 until 1987. Lou and his wife, Joyce, have five children, Tom, Louis, Tara, Christopher, Barry, and nine grandchildren.